Because it is self-fertile it does not need another variety to act as a pollinator. Supplied as a 1.2m tall, grower quality, multi-branched bare root tree. Grown on a dwarfing root stock. Will grow to approx. 2m (6-7 ft) in 10 years. 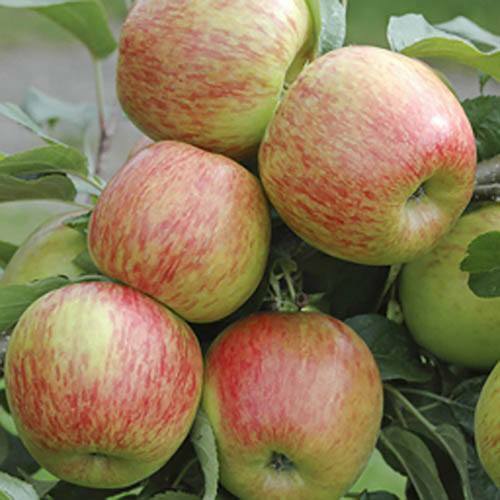 'Braeburn' is the UK's most popular eating apple variety by far and it will easily grow and flourish superbly in your garden! The crisp and juicy white-fleshed fruits have what is considered by most to be the perfect sweet/tangy flavour balance, literally providing a flavour explosion with every mouthful! The gorgeous fruit will be ready to pick fresh from your tree by mid-October each season and will store well until the end of January if kept chilled but frost free. Because it is 'self-fertile' it does not need another variety to act as a 'pollinator'. Perfect to plant in to your garden or grown in a pot on your patio. Supplied as a 1.2m tall, grower quality, multi-branched tree, grown on a dwarfing root stock.